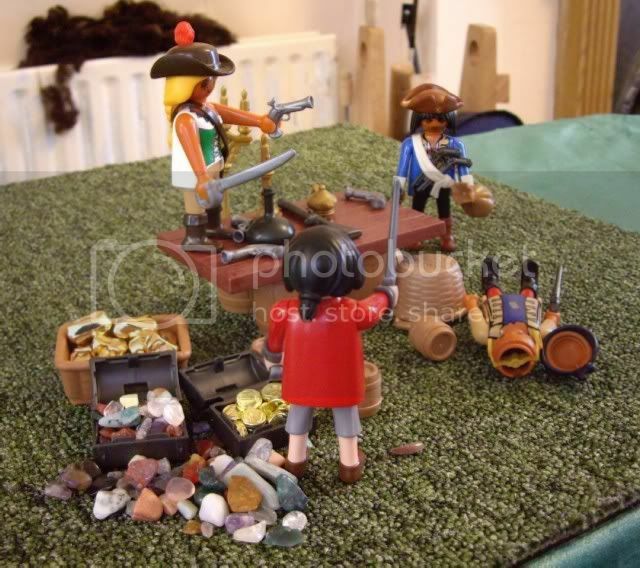 This is my favourite set from the new Pirates series - plenty of figures and accessories to create stories with. 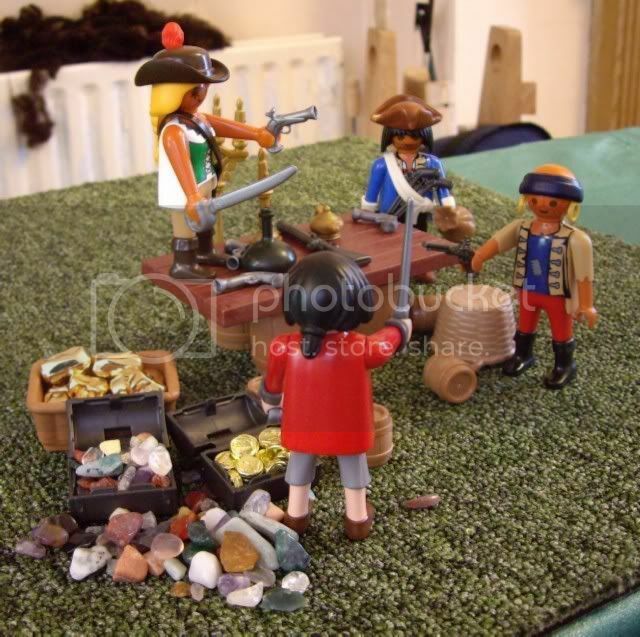 It's the successor to 3749 and 3939, all pirate groups having a celebration of sorts. Several new pieces appear for the first time here, at least in my recollection. The blue pirate has a new hat and white sash that holds 2 long-barrelled pistols, and the table on barrels is new. Oddly there's a hole along one edge, so the table may appear elsewhere with something in that hole. All four figures are new to me. One has a bald head, and another has both a new beard style and new hair with a small tie at the back. The female pirate is a welcome addition to the short roster of female pirates so far released. In this case, the crew seem to have been more successful. They're hauling a basket filled with gold nuggets, a fair stash of doubloons, some gold candlesticks and a lamp, and even a chest of uncut gemstones. What I love about these pirate groups is that there are so many unanswered questions - what's going on here? What's in the smaller barrels? Gunpowder, rum, or maybe gold dust? Do they have a boat hidden out of site, or are they stranded with their haul? Who did they steal all this from, and have they really made good their escape? Three of the figures have tanned skins, but the female (I hesitate to say lady) has blond hair, so this may be a deep tan from the harsh Caribbean sun, not a natural skin tone. The bald figure has facial tattoos. The fourth figure is paler, and more smartly dressed. Is he their captain, or a new arrival to the area? The rum flows, then runs short, and tempers flare. Blades are drawn. Gun fire echoes across the bay. There are a LOT of guns in this set - 2 long blunderbusses, 3 long-barrel flintlocks, and 5 pistol blunderbusses. The 1st Mate is shot down, the top of his head blown clean off, revealing that his headscarf is actually moulded in one piece with his bald bonce. 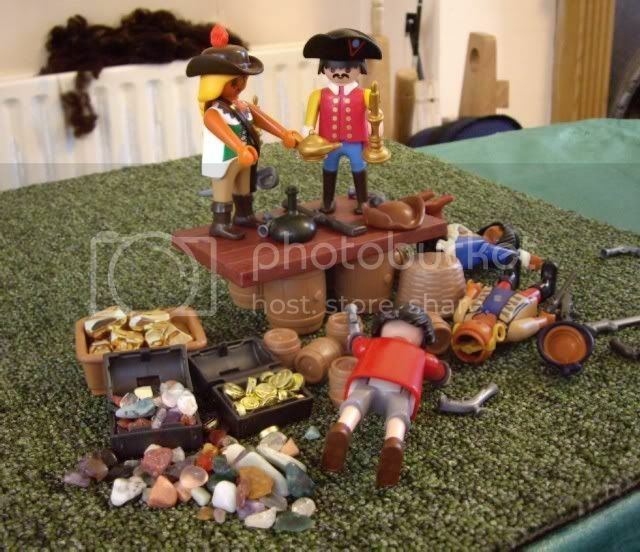 The 2nd Mate shoots the captain - now he can share the treasure with his lady. How can she resist his smart new hat, white sash, and blue coat? Except...why is she pointing a gun at him and smiling? The true mastermind behind the quarrel is revealed. It's taken 18 years of plotting behind the scenes, but now he's got the treasure and the girl. Which to sample first? I love this set, but would have liked more variety in the choice of leg mouldings. Three of the figures have the same leg & boots moulding, and given the variety now available to the designers, it would have been nice to have something different. The bald figure with a ragged-sleeved shirt would have gone well with ragged trousers and bare feet. At least the boots are sensible colours, not bright blue or orange as we have seen elsewhere. However this is a small gripe, and I bought two sets to my Pirates collection immediately, and may add a couple more for spares. ... but now he's got the treasure and the girl. Which to sample first? I vote for the "treasure" first, Martin! A wonderful review, AND a great story! I wondered whether or not that "pistol-totin" sash went completely around the pirate. Now I know! Thanks the super photos and the fabulous entertainment, Martin. A very original idea for a set review! I enjoyed this a lot. Thanks, Martin! I see what you mean about the female pirate. Very unladylike behaviour! Either your reviews are getting more creative, Martin, or the set is really inspiring to play ... Maybe both. Thanks. It was entertaining (as a story) & informative (as a review is supposed to be). & The entertainment came for free! Great story review Martin . I am looking forward to the set hitting the US shores in the near future . that sets looks like it comes with a lot of accessories , was it expensive ? what is that black thing on the table supposed to be ? a bottle or something, why black ? all i would recommend is a back drop of a sea scene or something to hide the boxes and such . after it went through the vacume cleaner . A bottle of rum! 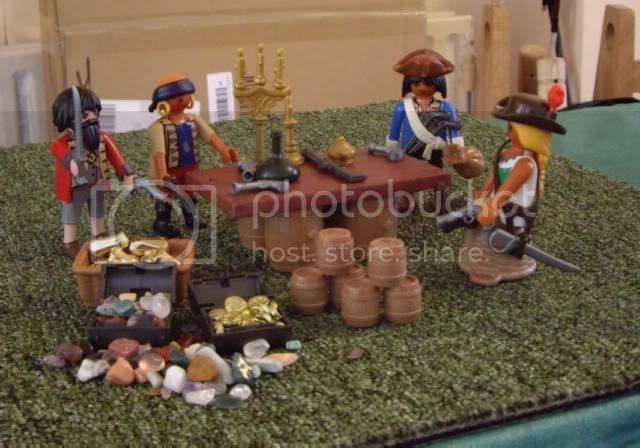 There's one, too, with the Spanish couple on a long boat, I think (take a look at the German site), and one with the new "pirate captain", which I just bought in a Carioca toystore, two days ago It isn't black but very dark green. Excellent review, Martin, of a very attractive set. Many thanks. I could give my figure a name, but it needn't be the same name for your one Gus! We're encouraged to use our imaginations, after all! Pricewise, this was £13 in the UK. Specials are £2, the next smallest sets, usually a single figure with some accessories (e.g. 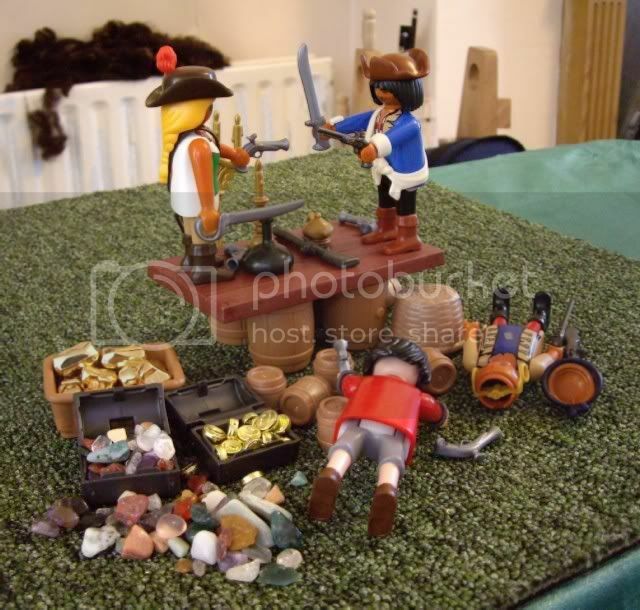 the pirate captain 4293) are £4-5, a figure on horseback or with a motorbike is currently £6, sets with 2 figures & more accessories (e.g. the Spanish rowboat 4295) are £8-9, and the next step is the £12-15 range. The bottle is a rum bottle, that style was very popular at the time. This was a quick review, so no time to produce an elaborate backdrop. I encourage you to use your imagination to fill in the scenery.